Monogram Meredith: FREE FOOD- Wednesday only! If you refer someone to Monogram Meredith and they order a shirt, YOU will get a free batch of desserts and be featured on my blog! 1. Go tell all of your friends, family, Twitter followers, Instagram followers, WHOEVER, to check out my blog and Etsy shop! If they order a shirt, tell them to include your first and last name in the e-mail or buyer's note. 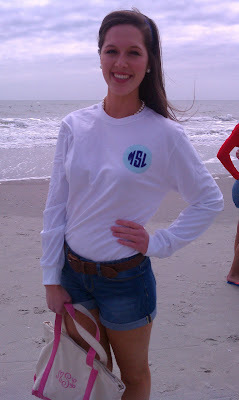 Everyone go check out @mlscroggin's blog to order a cool monogrammed t-shirt and help me get free desserts! Look in her bio for the link! 2. I will contact you to let you know that someone has found my shop through you so that I can get you some free goodies (that may or may not have been on my blog before- Oreo Cookies, anyone?). 3. You will not only get free desserts delivered to you, but when I write up a post about this whole experience, I'll include your name and a shoutout to your social media usernames. I mean, don't we all want more Twitter/Instagram followers? 4. If you personally want to order a shirt, feel free to do so and get your own desserts! The more the merrier, right? This is an experiment, but a FUN one at that! So, 1-2-3, GO, because this is Wednesday only!